The stroke of midnight marked the start of the Singles’ Day sales, also known as 11.11, as it falls on November 11 each year. It is regarded as the single busiest 24 hours for online shopping in the region and in the country. 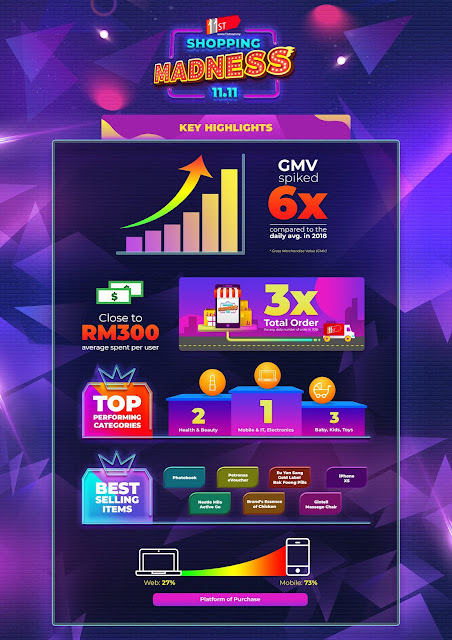 This year, 11street, one of the leading online marketplaces in Malaysia, offered shoppers specially curated Shopping Madness 11 deals and discounts which saw its total gross merchandise value (GMV) surging by six (6) times compared to the daily average in 2018 and double the increase it saw in 2017. The total number of orders during Shopping Madness 11 this year tripled the daily average number of orders on any ordinary day in 2018; 2.6 times compared to 2017. Apart from an increase in the total number of orders, 11street shoppers also had a higher average order value as they spent close to RM300 on each order. 11street attributes this growth to two major drivers: a wider product variety from its growing base of sellers and brands as well as highly competitive prices offered to customers. The top performing categories on 11street during the Shopping Madness 11 sales were Health & Beauty, Mobile & IT, Electronics, and Baby, Kids & Toys. Some of the most sought-after products in these categories include Eu Yan Sang Gold Label Bak Foong pills, iPhone, Nestle Milo Active Go and Brand’s Essence of Chicken, as well as Petronas and Photobook eVouchers. The prominence of Health & Beauty as one of the top performing categories during the Shopping Madness 11 sales are indicative of the changing lifestyles of Malaysians who are becoming more health conscious. 11street CEO, CHEONG Chia Chou said, “We usually see our customers flocking to purchase smartphones and electronics during major sales days such as 11.11. In fact, in 2017, several smartphone brands were amongst our best-selling items. However, this year, we also see customers lean towards health and beauty products, with our health-conscious customers purchasing supplements and other health-related products such as Gintell Massage Chairs. Apart from a heightened level of health consciousness, shoppers also seem to be shifting more towards mCommerce, due to the growing mobile penetration in Malaysia. During Shopping Madness 11 sales, 73% of transactions were made via mobile devices. This could also be attributed to the diverse payment methods available to shoppers on 11street, including eWallet services such as Boost, making shopping online as convenience, seamless and rewarding as ever! Shoppers can still be in Madness Heaven with flash deals happening until November 14. 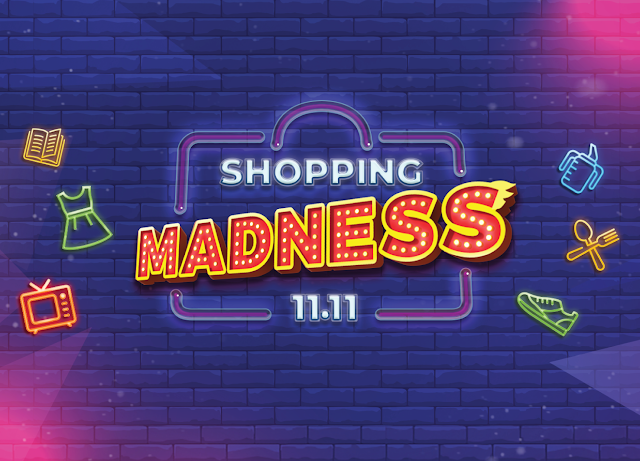 Then, The Madness Continues on 11street until 27 November 2018, where shoppers will see shocking deals and free shipping, as well as bundle deals and flash deals up to FIVE TIMES A DAY! Head over to https://promotion.11street.my/madness-campaign/11-11 to find out more. Customers can also download the 11street.my app on iOS or Google’s Play Store.